Though the fighting ended on 11 November 1918, the effects of the Great War can still be seen today. A seemingly isolated act set in motion a series of responses that culminated in a global conflict. The result was the greatest and most destructive war up to that time. The legacies of this conflict contributed significantly to an even more destructive war a little more than twenty years later. 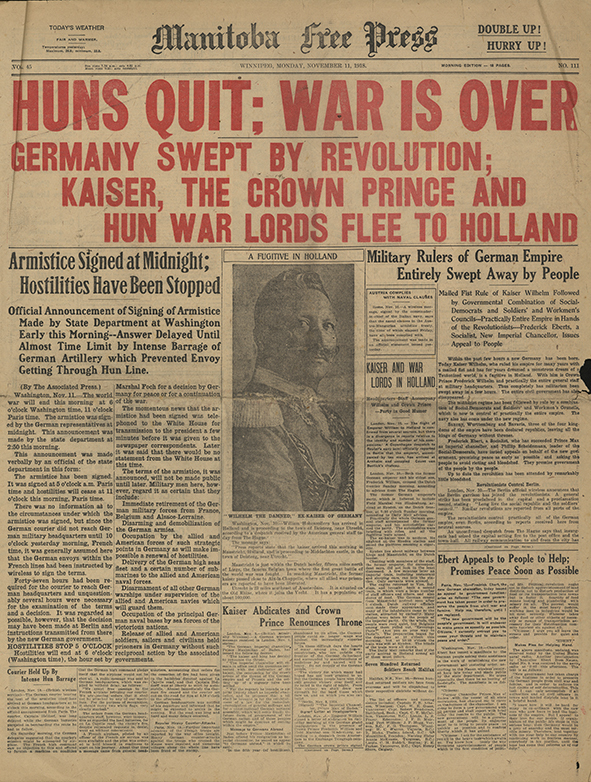 The Great War was the pivotal event of twentieth century. It was a transformative event. Three of the world’s great empires ceased to exist. The idea of the nation state was given a legitimacy that was not there before the war. Many of today's borders were drawn in the wake of the conflict. By war’s end the Czar of Russia was dead and a Bolshevik government ruled in his place. Cities around the world saw revolution and social upheaval. Canada was not immune to this time of change: a new sense of nationhood had taken root by 1918, but in the process, the country was a much different place than it had been at the start of the war. On the heels of end of the fighting in 1918 came the influenza pandemic. A great weariness gripped the globe. To many, there was a need to turn the page and move on. Though the memory of the carnage of the war was still fresh, there was a feeling that Canada wasno longer in the tunnel but had emerged into the light. The material in this and other sections is taken from the University Archives and Special Collections. There are six sub-categories in this section.